Our family and the kids in our small group Bible study are so pleased with the What's in the Bible? DVD series. The kids are learning so much about the Bible and God's big rescue plan for his people. The adults are learning quite a bit, too. 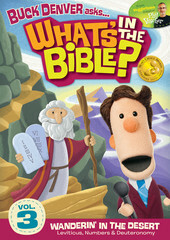 We're very excited that so many people enjoyed our What's in the Bible? Review Flashcards for DVD 2. I've finished the next set of flashcards for the What's in the Bible? DVD 3 (Wanderin' in the Desert). Volume 3 finishes up the Pentateuch with the books of Leviticus, Numbers, and Deuteronomy. You can watch a few video clips from DVD 3 here. These flashcards are great for extra review to go along with the What’s in the Bible? DVDs. Since I make these flashcards to use with a wide range of ages, simply choose the questions that you think will work best for your kids. These sets even have a couple of blank cards, just in case you'd like to add your own questions. We’ll share the other sets as I finish them so sign up for free blog updates so you won’t miss out. Today's Questions: Have you seen the What’s in the Bible? DVDs? Do you think you might like to use them with your children? Why or why not? thanks for sharing, we have the first "Whats in the Bible" movie and really enjoy it! I have not had the chance to buy more, would like to soon. Thanks so much for sharing this! I'm having trouble finding the link that takes me to the flashcards. Every link I've clicked on has led me to the DVD website. Thanks for helping me!